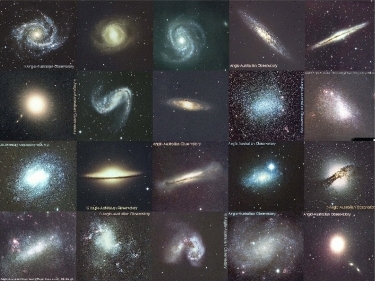 To the right are a selection of galaxy images taken from the Anglo-Australian Observatory. I study these beautiful systems called galaxies to try to understand how they formed: their shapes, sizes, colours, and stellar populations; their mass breakdown into stars, dust, gas and super-massive black-holes; and their energy outputs from the ultra-violet through the optical and infra-red and on into the radio. I want to know how they formed, how they hold themselves together, and how they will continue to evolve into the future. Without galaxies we would not exist. It is only inside galaxies where stars can form and process the primordial Hydrogen and Helium into the elements required for life. Click here to fly-thru my data.